A hiatal hernia is a condition in which part of your stomach passes through a small hole in your diaphragm. The exact cause of a hiatal hernia is unknown, but obesity, severe coughing and sudden abdominal exertion are risk factors. Most people with the condition have no symptoms, reports NYU Langone Medical Center. But if you’re experiencing heartburn, you may need to be careful about what you eat, including peppermint and foods made with peppermint. Consult your doctor to discuss your diet. A hiatal hernia can cause the acid from your stomach to reflux into your esophagus, which results in pain and discomfort. This type of acid reflux is known as gastroesophageal reflux disease, or GERD. Common GERD symptoms include heartburn, belching, hoarseness and chest pain. Diet is an important part of the treatment plan for GERD and includes limiting foods that may exacerbate your symptoms such as peppermint. Peppermint oil may play a role in regulating biochemical processes in your stomach and intestinal tract that help calm and relax the muscles. This is why peppermint is often recommended as an aid to those with indigestion or gas. However, the peppermint oil also relaxes the esophageal sphincter muscle, which is the muscle that protects your esophagus from the acidic contents of your stomach, and may exacerbate the GERD associated with your hiatal hernia. Peppermint is a common flavoring used in chewing gum and toothpaste. 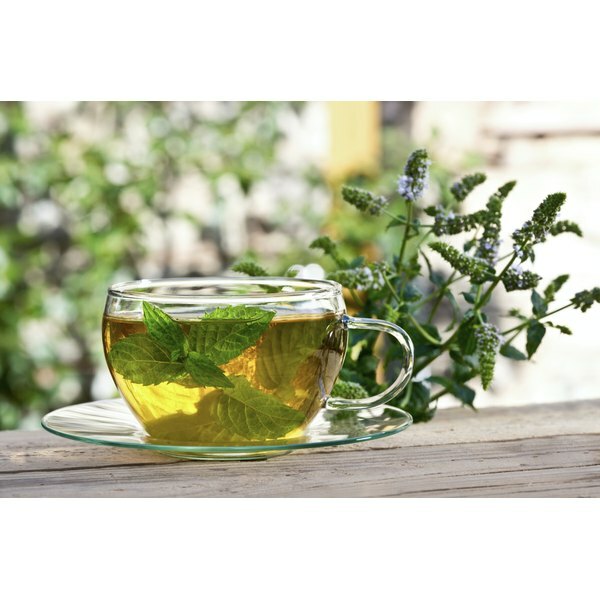 It is also found in candy and breath mints and is a popular herbal tea. The University of Maryland Medical Center recommends you avoid peppermint if you have a hiatal hernia or GERD. However, everyone’s tolerance is different, and you may be able to enjoy peppermint in small amounts, says the McKinley Health Center. Chocolate, coffee and alcohol also relax the lower esophageal sphincter, and you should also limit or avoid these foods when experiencing GERD with your hiatal hernia. You may also need to limit your intake of other caffeinated foods and beverages; foods high in fat such as fried foods; carbonated beverages; spicy foods; and acidic foods to reduce esophageal irritation. Eating four to six small meals throughout the day and not eating two to three hours before bed may also help.